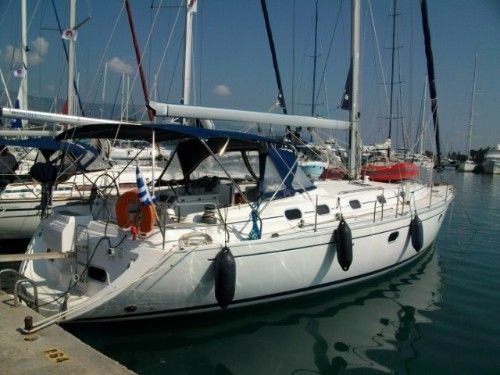 Looking to sail from Corfu? Search to find and book your ideal boat, or read everything you need to know: prevailing winds, where to sail, how to get there and more! It's easy to see why sailors rave about the Ionian islands as they offer perfect conditions for sailing - brilliant sunshine, warm and reliable winds, and plenty of islands with anchorages and marinas to explore. People have been sailing around here for thousands of years, and the Ionian is a sea that has been traversed by Odysseus and Achilles, amongst millions more. From Corfu, you'd usually explore the North Ionian: the beautiful Paxi islands offer stunning cliffs, clear beaches, and great places to snorkel; Parga, on the mainland is a colourful village built around the marina with tavernas serving the freshest seafood; there's incredible beaches along the coast of Corfu; and the fantastic authentic fishing villages of Sagiada and Petriti. 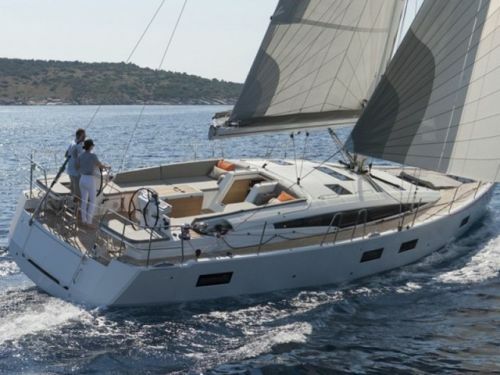 The Ionian is a famously brilliant place to sail, so go ahead and book your charter yacht today! Corfu island is big enough to offer plenty of things to explore without even leaving the island, but there are outstanding sandy beaches and clear seas throughout the region, and it is a pleasure to sail around them. Of note, Paxos and Antipaxos are areas of outstanding natural beauty, Petriti and Sagiarda are cute fishing villages, and Parga is a lively and spectacular-looking tourist town. A fantastic authentic village which is hidden away from the tourist resorts by lush green forests. It's a treat to sit on the boat and watch the local fishermen get to work. A pair of beautiful islands just south of Corfu island, with stunning beaches and incredible scenery combining dramatic cliffs and caves, long beaches, crystal clear water and pretty fishing villages. A picture postcard village which is built on the hillside around a natural harbour to make the marina feel like a giant and incredible amphitheatre. Popular with landlubbers too, for its beaches, instagrammable scenery, and good range of places to eat and drink. You could head off in almost any direction from Corfu and come across a pretty fishing village, a beautiful secluded bay, or a long sandy beach before long – so it’s not always vital that you have a rigid plan for your holiday before you go. Often it’s best to see what the wind is doing, and plan your route from there. 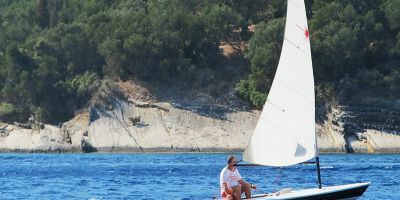 This is a 6-day itinerary which takes in the very best that the North Ionian, with a diverse mix of towns, beaches and hidden gems so that you can make the most of your time on a luxury private boat. It’s only 6 days because often you might not get checked-in and stocked up on the first day until it’s too late to do any meaningful sailing. You’ll also need to return the boat back to base on the Friday night, so that our partners can check the yacht before it goes out sailing again with someone else the next day (but you can obviously still sleep on the boat). In total, this route is 98 nM and covers the best parts of Corfu and the surrounding area - so you’ll be able to say that you’ve literally seen it all! This means sailing an average of just under 20 nM a day. An average yacht should be able to travel at over 5 knots an hour, so most days should be fairly relaxed and you should have plenty of time to stop at bays and beaches as you pass them if you wish. Check that everything is stowed below deck, check that no other yachts are moving off, and lets get out of here! You can go early to beat the traffic, or go late in the hope that the boats next to you have already left, so you have an easier start to the week. Wave to Gouvia town as you meander out of the marina, then point the nose of the boat in a South-Easterly direction like a pro. 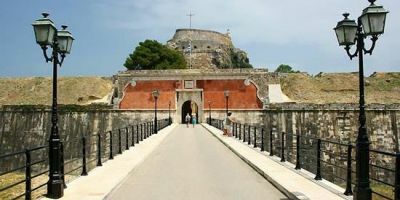 After a couple of miles, you’ll get a brilliant view of Corfu old town on the starboard side, with its imposing fortress making an interesting backdrop for your first photos to send home. After admiring the old town, we're heading off pretty much due East - it should be a straightforward reach across the prevailing wind to end up at delightful Sagiada. Sagiada is technically on the Greek mainland, and only a few kilometres from the Albanian border, but it has a real island feel to it, and it takes hours to drive to the nearest big town. One of the local tavernas here - Alekos - claims to offer the freshest (and tastiest) prawns in the Med, so if you're a fan of seafood, you really ought to give them a go! From Sagiada, we're following the beautiful Ionian coast-line south to our next port of call. There's plenty of bays you could stop at along the way to Sivota Mourtos - feel free to stop somewhere, throw down the anchor and dive in. You should be running with the prevailing wind, and, if you’re feeling up to it, you could even throw in a bit of goose-winging for the thrill of it. Sivota is a name you’ll come across a lot as it used to be used to name the safest port in the area. Regrettably, the moniker ‘Mourtos’ means death in Greek, and it recalls the massacre of the Turkish army here in 680 BC! Thankfully, the bay has been transformed from a graveyard into a very cute Greek village with the best views of the sunset in the whole Ionian (so grab a drink or your camera, and settle in). Owing to the fact that this is also a popular tourist resort with landlubbers, there's a great choice of places to eat, drink and relax. The islands nearby also offer great places to bathe if you want to get a little further away from the beaten track. From Mourtos, we’re just hopping through the islands and around the Greek mainland to nearby Parga, which is a popular tourist resort with young and old alike, and which will be our last big town for the week (so stock up here for a few days to avoid paying excessive island prices). Follow the coast South then South-East, with the prevailing wind behind you, and Parga will appear all of a sudden on the port side – a glorious amphitheatre of buildings perched on the hillside around the bay. If you couldn’t see it for yourself, you really would imagine that it was photoshopped, and it’s about as picture-postcard as you can get. Parga itself is a delightful place to stroll around, with narrow cobbled streets and tiny bars and restaurants (almost all with a view and fine seafood) and live music performances throughout the summer creating a vibrant and atmospheric place to be. Leaving Parga, you can probably see the Paxi islands, just 15 nM away. They’re in a South-westerly direction which means that you’ll be reaching across the wind, paying attention for the few ferries a day that link Preveza and Lefkas to Corfu. The Paxi islands are made up of Paxos and Antipaxos. Both outstandingly beautiful, but both very different. The uninhabited Antipaxos is full of beaches and vineyards, whilst Paxos has a number of towns and is mainly focused on growing olives. It has stunning scenery, combining dramatic cliffs and caves, long sandy beaches, cute little villages and green arable land. 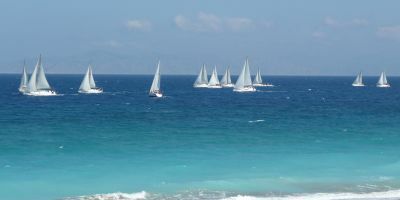 To appreciate the best of both worlds, we recommend dropping the anchor on the north side of Antipaxos and visiting Voutoumi beach – arguably the best beach in the whole of Europe, and certainly the best unspoilt one. Swim in the warm crystal clear waters here and it’s hard not to feel ultimately relaxed. From here, we’re heading Northwards to Gaios, the capital of Paxos island, for more stunning views. The locals will give you a friendly welcome into the port, and you can stroll around the old Venetian town and find a bar. Those who have already had enough nature and are missing civilisation will be glad to hear that Gaios is also the home of the only nightclub for around 25 nautical miles! Today is the longest day of our trip, but at 21 nM it shouldn't feel too arduous. We're heading back to Corfu island, which will see us beating up the prevailing wind, or ideally, close-hauled if the wind allows, as we work our way from Paxos past all the major Corfiot tourist resorts on the South coast, and up to the enchanting fishing village of Petriti. Despite being in the middle of tourist-central, Petriti is hidden away from the major resorts by lush green forests, and the atmosphere is of peace and tranquillity as opposed to the giant strips of bars, clubs and karaoke outlets which are just up or down the coast. The village is focussed around the marina area, and bursts into activity in the morning and early evening, when the local fishermen get to work. The town is big enough to have a reasonable array of shops and restaurants, and it's a beautiful place to spend the last night. .
And finally. Unfortunately, we’re round to the last leg already. Where has the time gone? It only feels like yesterday that you were diving in Antipaxos or dancing in Parga. Today we’re completing the final leg of our tour around the Ionian, a place which has hopefully captured your imagination (and your heart). Our journey home sees us beating up the prevailing wind back past Corfu old town, and to get safely tucked up back in Gouvia marina. Once in the marina, head to the fuelling station, where there will likely be some form of semi-chaotic queue during the peak season as everyone returns their boats during the same 3 hour window! Our yacht charter partner will come and inspect the yacht, and tomorrow morning you’ll need to check-out and get the plane home. If you’ve not had the chance to go to Corfu old town, it is well worth the trip (when are you likely to be in Corfu again) and the old town is now a huge UNESCO world heritage site, with castles, cobbled streets, loads of tavernas, and even a cricket pitch to see. That said, Gouvia is also a fun place to be, particularly on the last night of people’s holidays, and when all the sailors will be out in their finest, and with stories to tell. Hopefully you have enjoyed the week, and the sailing, the boat and the crew have all impressed you. It’s been a pleasure to sail with you, and we’d love to hear about your adventures on the seas. And next week, when you’re feeling nostalgic and missing the sea, check out PlainSailing.com and start planning your next adventure! Corfu has long been loved by the British for its fine weather, so it should be no surprise that the weather is warm pretty much all year long. In winter, it’s not unusual for days to still be filled with sunshine, even if it’s not quite sweltering weather, and in summer, the average temperatures hide the fact that there can regularly be days where the temperatures reach the high-thirties in Celsius in July and August. Some might say that is too hot, and it can certainly zap you of most of your energy. The beauty of the climate is that you can dig out your shorts, t-shirts and flip-flops from around April to September, and you can be sure that almost every day will give you an excuse for getting an ice-cream. Bliss. If you’re not a fan of the hottest weather, then potentially avoid July and August, when you’re most likely to get stifling temperatures and/or the sun will be so strong that you can literally get sunburnt from a few short minutes in the mid-day sun. The Ionian is a sheltered part of the Mediterranean, so the sea doesn’t tend to drop below fifteen degrees (which is on the cold side of mild), even on the darkest, coldest winter days. It all warms up nicely come May-time, when temperatures reach a more comfortable (but still fresh) 20 degrees, and by July, you could mistake the sea for a heated swimming pool, when it hits an incredible 25 degrees. 25 degrees means you won’t have to think twice about whether to jump in or not. 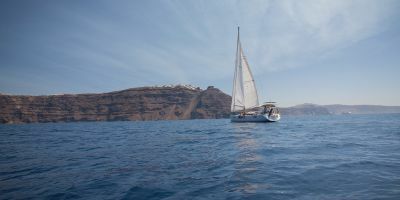 Greece has built up its reputation as the biggest and best cruising ground for two main reasons – the exciting-ness of the cruising zone (with all the islands and cute fishing villages), and weather that is as much perfect for sailing as it is dependable – in summer, the sun will shine, and the wind will blow. In the Ionian islands, from May to September, there are prevailing winds of Force 3 to Force 6 which whistle down the coast of the Greek mainland, from a Northerly direction. The winds mean that you can quickly work your way up and down the coast, though you’ll make more progress running South with the wind behind you, than beating your way back Northwards. Given the potential heat, having dependable winds means that there is a way of getting cool, and you’ll certainly notice the difference in temperatures between when you’re in the marina and when you’re out in the open seas. Winds tend to calm down after dusk, sometimes to nothing, depending upon how warm a day it has been. 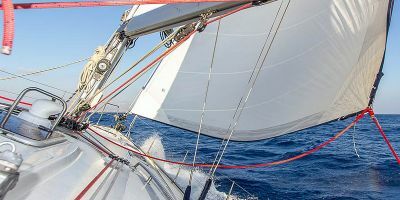 Outside of the sailing season, the winds can be a bit less predictable, and can arrive as storms from the south, or as cold mountain winds from the North. What is the Current Weather in Corfu? Corfu has been a major tourist destination for decades, and more and more people are attracted to this unique blend of mountains, beaches, cliffs and fishing villages every year. Aside from beaches, tavernas, delightful seafood, and the usual tourist resort attractions, the island offers the somewhat dubious claim of being the home of Nymphs, which dance in the local waterfalls. The island has a vast number of stunning beaches, which offer great places to relax and enjoy the sunshine, partake in beach activities and watersports, or just places to sit and enjoy an ice-cream. Corfu old town has a mix of historic architecture, including two castles to explore (both with fine views out across the sea). It has a colonial British feel to parts of it, and even has a cricket pitch in the centre of the town (and Corfu have got the best cricket team in the whole of Greece), but it’s the narrow, cobbled streets that have the most charm, and there’s joy to be found in finding a seat outside a restaurant or bar and just watching the world go by. As night falls, the main resorts of Corfu blast into life, and the old town becomes a little livelier (and prettier). The island offers a mix to suit everyone - from package-holiday resorts with strips of bars where parties can continue until dawn, to more refined fine dining restaurants and cocktail bars – and everything in between. Corfu has a great range of festivals and feast days. The main events of the year are the Carnival and Easter, but it seems there is always something to celebrate on the island. Carnival sees street parades, people dressing up in old costumes, and dancing the night away. 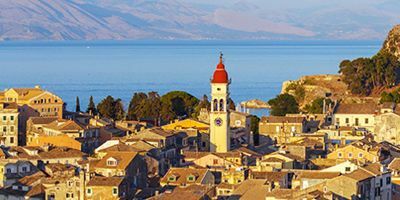 Based loosely on the Venetian carnivals (from when the island was a part of the Venetian empire), now Corfu has a whole host of its own traditions. The old town is noted across Greece for the enthusiasm with which it celebrates Orthodox Easter (which is normally a couple of weeks or so after Catholic Easter), and events here are often televised nationally. The whole town is involved in candle-lit parades, plate smashing, and eating giant feasts, and there is a spirit of goodwill about the place that makes the whole island a happy place to be. Another celebration of the history of Corfu is the Varkarola festival, which recalls the day Saint Spyridon saved the island from a siege by the Ottoman army in 1716. It takes place in mid-August and includes traditional singing and dance, and choirs performing from boats, before they set fire to a boat and fill the sky with fireworks. Modern traditions include a wine festival, a beer festival organised by the local brewery, and the Helios Festival, which is a four day festival of electronic dance music. Olympia Mare – the restaurant in the marina offers brilliant views of the marina (if you’ve not had enough of them already), and is said to do the freshest seafood in Gouvia! It has a broad menu, and almost everything is delicious. (Gouvia marina). Da Roberto e Fei – don’t be fooled by other people saying they have the best anything in town – if you want a decent pizza, just come to Roberto e Fei, which is only a few hundred metres from the marina (Main Street, Gouvia). Venetian Well – If you want to eat the best that Corfu old town has to offer, then you should head to the Venetian Well for a five star dining experience, complete with all the trimmings. They have the best reputation on the island, and serve up a mix of classic Mediterrannean and Greek dishes with aplomb. Almost everyone who eats here says ‘Wow!’ – either about the food, the location, or the price. (Kermastis Square, Lili Desila 1, Corfu Old Town). O2 Old School Rock Bar - A live music venue based near the marina in Gouvia, this is where you’ll find most of the sailors after a day out at sea. Don’t be scared off by the name: it’s not just rock music (more pop covers), but is usually a lively bar and has a great choice of drinks – including cocktails (Main Street, Gouvia). Edem Beach Club - One of the oldest and best beach clubs in Corfu, which, as the name suggests, is based on one of the most beautiful beaches in Corfu, and offers a chilled out beach vibe during the day, followed by music (sometimes from international DJ’s) well in to the night. It’s the next bay along from Gouvia, so not so difficult to get to from the main marina (Dassia beach, 490 83, Corfu). Telesilla Hotel *** – c. £60 for a double room – this hotel is the closest hotel to the marina, as well as being one of the best rated hotels in the Gouvia area. Enjoy breakfast by the pool or on their sun terrace whilst waiting for your boat to be ready, before making a short 100m walk down to the marina to hop on board. Art Hotel Debono **** - c. £120 for a double room – also based in Gouvia, it’s only a short stroll downhill from the Debono to the marina, but this is a 4-star luxury hotel which is certain to set your holiday off on the right foot. It has beautiful grounds, a luxurious pool, and a tennis court. Arcadion Hotel *** - c. £90 for a double room - this is our pick of the hotels in the old town. It’s unbeatable for location for the old town, and offers brilliant value for money. It has great views, amazing staff, and serve a hearty breakfast. 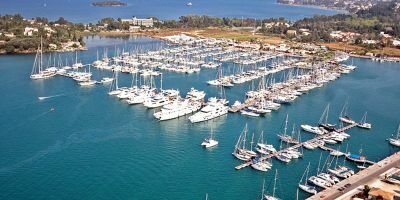 Gouvia marina is the biggest marina in Greece, as well as being the first to be privately owned and run. It offers excellent facilities, including a collection of shops, multiple bars and restaurants, and even a post office. Gouvia town is a short walk away from the Marina, which is a popular package-holiday resort and caters for every holiday-makers whims. 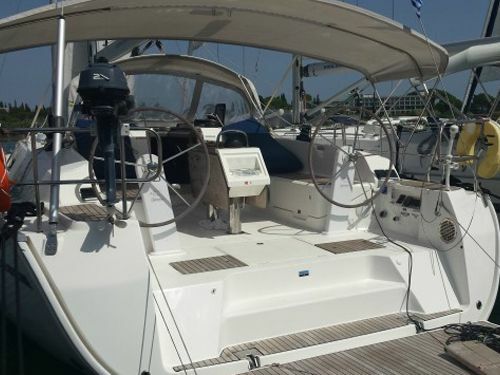 The marina is well organised, offers wifi, and is near to a beach, a park, and a swimming pool, and just a bus ride away from Corfu town centre. 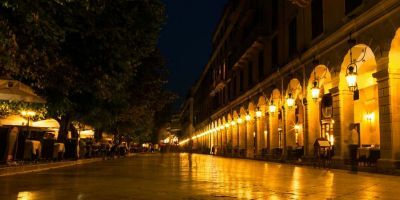 Corfu has been very popular with tourists for many years, which means that there are excellent travel connections to the island from across Europe, particularly during the summer months. Arriving by air is the easiest way to get to Corfu, but it is possible to fly to Preveza on the Greek mainland and get a ferry across if required. Gouvia marina is 7km away from the airport, which is a 15 to 20 minute taxi ride – talk to our team if you would like us to arrange a transfer for you. Public transport options are available, but not very straight-forward, and buses are often a bit sporadic, so it’s not something we’d recommend, particularly with much luggage. You'd need to should catch a bus from the airport to Corfu Town, and, from the main (San Rocco) bus station, you’ll need the #7 bus (ask the bus driver to let you know when you are near Gouvia marina).